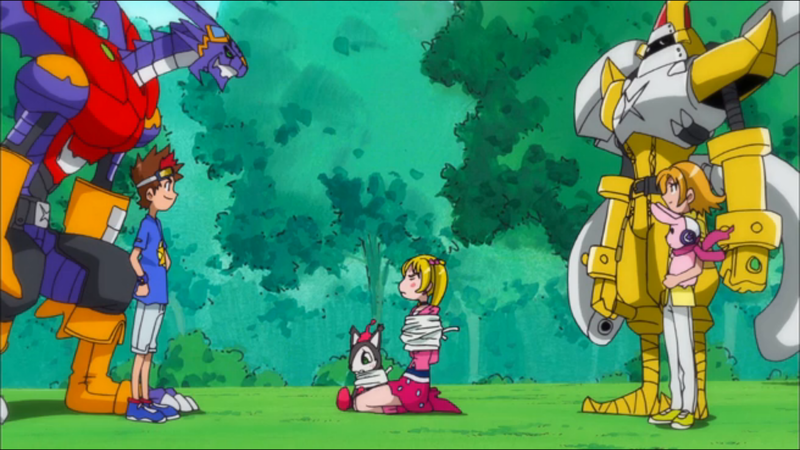 Digimon: System Restore: Xros Wars Episode 59: Cuteness Caution! The Cute Hunter, Airu's Trap! Xros Wars Episode 59: Cuteness Caution! The Cute Hunter, Airu's Trap! In this episode, everybody loves Cutemon! Yuu! Yuu's fangirls! Tagiru! And especially that deranged girl down the street who's obsessed with setting traps and enslaving cute Digimon! If there's one sincere thing about Hunters early on, and it would certainly be the only thing, it's Yuu agonizing over Damemon. Even if Yuu wasn't as responsible for his partner's death as much as Ken or Masaru were, Damemon symbolizes all of the ways that Yuu screwed up. His innocence of getting pulled into a world of false promises. His reckless fighting strategy. His constant denial of reality. He even represents his penance in not having a Digimon companion as Tagiru and Taiki join the Hunt. Damemon, by all logic, should have been reborn, so it's extra tragic that he's not around at a time when Yuu is dying to help Taiki and seek some measure of redemption. We get a more intimate look at Yuu's life, and Damemon might not even be the most unfortunate part. While Tagiru drools over Yuu's giant penthouse, hot sister and amazing cooking ability, all of these suggest that Yuu's life is quite miserable. 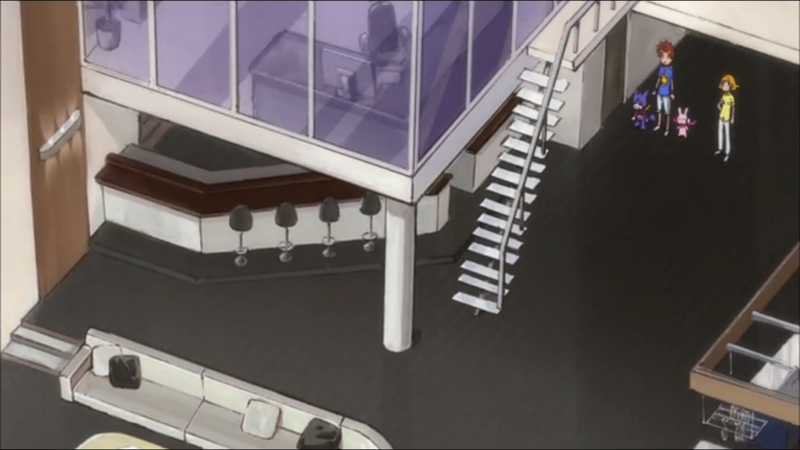 The apartment is gigantic, but also looks more like the world's swankiest bachelor pad than a proper family home. It's clear that the Amano family is wealthy, but Yuu's vague statements about his parents make you wonder how close he is to them. His bond with Nene can't be questioned, but for her to find success at her age has to put some terrible pressure on Yuu to use his talents to follow suit. Don't forget that sort of thing is what sent Ken down his path. Add in the banquet he serves Tagiru, somebody he doesn't even like all that much, and you have the portrait of a kid who is depressingly lonely and desperate for a companion. And here Tagiru suggests that it was just food-related problems... Yuu absolutely should have punched Tagiru in the face for that (at least Mami smacks him upside the head). 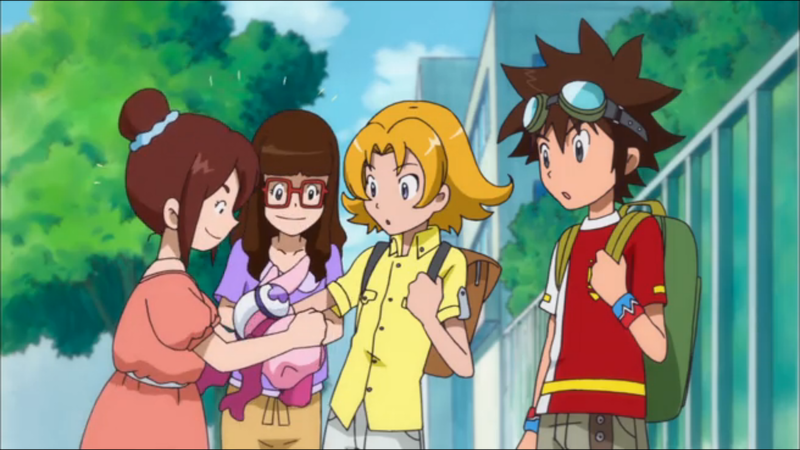 Believing that all it takes to lift Yuu out of this funk is an adorable Digimon, Cutemon sneaks into the human world and becomes an instant and obvious target for Airu Suzaki. Unless you count Mami, and nobody does, Airu is the only girl in Hunters outside the occasional Akari or Nene cameo. Like Ren, she will go to any lengths necessary to capture Digimon that meet her standards. She will flirt, she will attack someone without provocation, and she will bend the rules. Mostly, she will use her infamous traps, even opting to cast a wide net and reject Digimon (and sometimes humans) that don't meet her standard. Even Ryouma and Ren give her a wide berth, knowing she's absolutely mental but willing to put up with her because her traps round out their team nicely. They aren't at all enthusiastic about Airu's pursuit of Cutemon, but they assist her anyway. The level of teamwork they show is actually sort of admirable, particularly how they don't step on each others' toes or snipe each others' targets. There's definitely an “honor among thieves” vibe with these three, not that it makes them any less terrible. Eventually, Damemon does come back to Yuu, driven by his partner's willingness to put himself in danger to protect Cutemon from the rampaging Cho-Hakkaimon. Even without a corrupted human (or at least one corrupted by a Digimon), the notion of being drawn to human hearts stays intact. It's clear that Yuu's malicious side is gone and that he sees Digimon as living creatures that can live and die and need to be protected just like everything else. Even in this weird hunting business, where terrible children like Team ARR can thrive and the worst that can seemingly happen to a Digimon is captivity instead of death, clearly Yuu will play the right way this time. It does make you wonder about Tagiru, though. When Yuu admits that he was sort of playing around as a general, Tagiru is proud to say he's totally playing around, and that he loves hunting and capturing Digimon. Again, Yuu absolutely should have punched him in the face. What is the deal with Mami and the fanclub anyway? It can't just be basketball or they'd be all over Taiki as well. Yuu must just be the total package of brains, athletics and good looks. Thing is, there's something awfully sad about his fanclub not picking up on his issues. Likewise, Yuu would do well to spend time with some company that doesn't know about Digimon, but he doesn't seem to regard them highly enough to actually socialize. For someone who's not familiar with the human world, Cutemon knows well enough to freeze while Mami and company cuddle him. Nobody told him he needed to do that. Cutemon's “soldier of love” routine has a definite Amelia Wil Tesla Seyruun vibe, particularly the insistence on finding high ground to make his dramatic speech. Opossumon might be most complex character introduced this season, insanely jealous of anything Airu targets, but she turns her rage on said targets... aiding Airu's attempts to capture them. Quite the enigma that one. Useful as it was to have Ryouma and Ren support Airu by taking Taiki out of the picture, we never got any sort of resolution to that battle. Given Ryouma's interest in Taiki, it's sort of important to know what happened in their first fight. Damemon makes it a point to tell Yuu this is his default form now. Given it's the form he was introduced in, did most of his early scheming in and eventually died in, it's hard to remember that it wasn't originally his default form. It's a shame that they didn't have the necessary "parts" for this, but wouldn't it have been hilarious if they solved the dilemma by bringing back GREATEST CUTEMON? Seriously, Airu would only need to look at - and hear - that thing before deciding "On second thought, maybe this Digimon isn't so cute after all" and giving up. Fun fact: Airu seems very blatantly based on Mari from the old Digimon V-Tamer manga, and the whole emphasis on her girlish "cuteness" obsession and physical appearance is a very sanitized version of what Mari's whole deal was, which was much more....adult. I really shouldn't have to elaborate on that, look up any image of Mari and it speaks for itself. One of the most obnoxious elements in Hunters is pretty much established in this episode. Airu torments Yuu's friends, captures and electrifies him, and would have ended up murdering him save for Damemon's return. So why in the world would the show later throw in some ship tease between these two? I don't know whose brains are screwed up more: Airu's, or the writers'. Oh, come on. She wasn't going to murder him, that is you reading WAY too dark into this. And they got ship tease because Airu received character development - if you can't accept that, it's your problem, not the writers'.